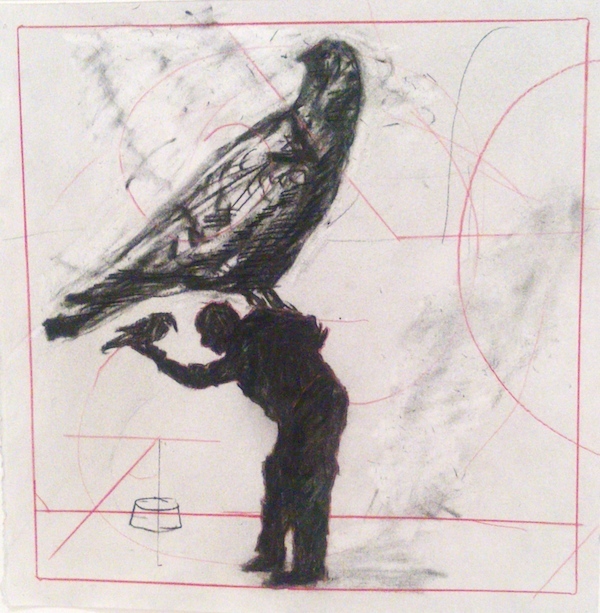 William Kentridge, drawing for The Magic Flute. A bird in the hand, tamed, and the birdcatcher feels he’s succeeded. But who’s caught whom? Akiba Roshi said the other day that everything happens within the body of buddha, which is the world. I understood him to mean not only the quotidian world we presume we know, but the many other worlds that exist, not beyond this one, but within it — for instance, the 96 percent of matter and energy that scientists know they don’t know. The life we take for granted suffused with a mystery to which we’re blind. Dr. Gabor Mate writes that for humans, “Psychological factors such as uncertainty, conflict, lack of control, and lack of information are considered the most stressful stimuli….” Much of our life is expended in efforts to control or manage our surroundings so we can feel safe(r). Uchiyama Roshi wrote that we cannot expect to perceive the infinite (world) with the finite (our minds). Since we can’t even survey this endless field of form and emptiness, we cannot hope to control it. So we narrow the field, believing we can at least establish and maintain control at home or work. But this goal proves no more attainable, and we come to learn that we can’t even control our own bodies and minds. We’re well evolved if we can manage to control our actions. An intriguing expression: environmentally conditioned helplessness. Conditioned by what or whom? By our valid suspicions that we are not in control? By disabling cultural beliefs that some lives are worth less than others? By family dynamics that yield our earliest reflections, distorted or not, of who we are and what this world is? Are the experiences that feel stressful tied to our deepest values, the things we cherish most? Logically they ought to be, but often they’re not. Six years ago, the night before my ordination, I was feeling sick to my stomach, anxious about the choreography of the ceremony, which is strict and detailed. Another priest, a former dancer, told me she had practiced her ceremony moves for days beforehand. I couldn’t imagine doing this, partly because I wasn’t sure enough of the steps to know I’d be rehearsing the right movements. I don’t take to formality or ceremony, although I can understand why some people do. I prefer simplicity, a graceful and heartfelt economy of speech and action. The fewest words possible convey the most meaning, provided they are the right ones. So I realized that evening that I was stressing myself about things I don’t actually care about. I asked myself what mattered to me about the ceremony; the answer was being wholly present for it, alive in every moment to the vows I was making. I didn’t want to be distracted from the meaning of the experience by concerns about whether I was “doing it right”. Afterwards, I wouldn’t care much if I stumbled or bowed at the wrong time, but I would deeply regret missing a moment that mattered because my mind was somewhere that didn’t. The definition of a stressor depends on what you assign meaning to. Where we place our attention largely determines what we feel and how we experience our lives. Sitting in meditation in front of a wall is the epitome of nothing happening. Yet when we stand up, we feel happy or sad, calm or angry, depending entirely on what we were thinking about, where we bestowed our attention. It’s worth considering whether the thoughts we make a home for in our minds, feed with our time, attention, and energy, are the ones we actually care about. Someone once said we think so many things that we know are not true. And that we know are not important. We can choose what to think about, and how we think about it. It’s not easy, but it’s more practical than trying to control a four-percent-known world. And we also get to choose how we respond to the things that stress us — whether we surrender to our conditioned brand of reactivity or helplessness or try something new. A small town in New Hampshire recently passed a law guaranteeing their residents clean air and water. It’s a local law, and some question whether it could prevent fracking or other environmental destruction in the area. But who would have predicted the strength of the resistance at Standing Rock? A lawyer noted that such efforts could be the future of American democracy: people deciding what matters most to them and protecting the particular piece of the infinite field on which they stand. Another uncannily timed and soothing post. How DO you know what is bothering me at any one time!? Thank you, Molly. Very interesting Molly. I often cause extra stress for myself by thinking of things that may possibly happen so I am trying to act first in order to see the outcome before I cause myself the added stress. The result is not always as bad as I imagined it could be but it is something I find hard to do. Thank you for your writing. Yes, it’s amazing how hard it is to simply act and let life respond, rather than wasting a lot of suffering on a small subset of all the things that might happen. Something I’m working on myself!